In your study of biblical Hebrew, you might want to consider adopting some of the practices described in the linked article below. This article resonated with me because as I became more confident of my ability to read the Hebrew text, I drifted away from ‘deliberate’ practice, i.e., the discipline of reading slowly, carefully, and deeply in order to discern the important nuances that are so characteristic of biblical Hebrew. This was not always the case. After my first year of formal classroom study, my practice was to read and translate no more that 2 or 3 verses using a lexicon 1)I now use an online BDB and selected other online resources such as this one based on the Theological Word Book of the Old Testament, TWOT and an online lexicon that is based on the TWOT but keyed to the New American Standard Bible. Like the author of the article in the link below, as my skill improved, my practice grew more undisciplined. I would often find myself ‘chasing’ words – looking up one word then getting interested in another, and then redirecting my attention to that one. Select a verse or two I haven’t translated before and read it slowly. Copy the verse in Hebrew (I use the Unicorn editor). Look up the meaning of, and parse, each and every word in your chosen verse: each and every word, no exceptions! Search your Hebrew Bible for other occurrences of each word in your chosen verse and carefully read those verses. You can use this online resource, here). Document any findings or interpretations that seem interesting or novel to you. Write these in your study log. This takes a long time. For example, at the moment I’m studying Genesis 15:4 and it’s taken me about 4 hours over the course of two days so far. I’m down the rabbit hole with the word, יִירָשְׁךָ (yi·rosh·khah – meaning ‘possess’ or ‘inherit’). Anyway, try to develop your own study habits. It’s not how much you study (time, # of flash cards, etc.,), it’s how deep you study. If you learn everything there is to know about one word each day you’ll become a master in due time. 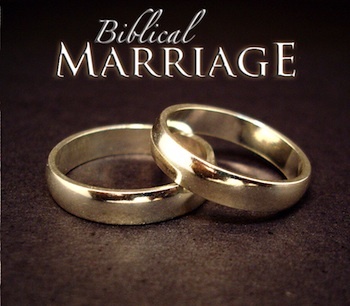 Over at my other blog (Thus Said the LORD), I’ve posted my latest article titled The Biblical Basis For Marriage. Quite apart from the theology, the appendix has the details behind the translation of Genesis 1:26-27. Just download (or read on-line) the PDF article linked (see above). Of interest to students of biblical Hebrew is that verse Genesis 1:27 illustrates a not uncommon error in translating verses – correctly matching the gender and number of an indefinite pronoun (e.g., ‘it’) with a grammatically compatible antecedent. For those interested in this challenge you also might want to study the commentary of Genesis 3:17-19, especially the phrase “by toil shall you eat“. The translation is quite complex to the point of being impossible (or, at least beyond my skill). Maybe one of you can offer some insight that I’ve missed. And, if you are still interested in the antecedent problem, check my commentary for Genesis 4:7. Most (all?) commercial Bibles I’ve looked at mismatch the antecedent. What do you think? In addition to the challenge of finding a grammatically correct antecedent, the translation of 3:17-19 presents first occurrence of what is called an “energic nun”. Among its many [arguable] complexities is the understanding that the use of an engergic nun signals the reader that a verb in its command form is to be translated as a declarative statement. Good stuff. When first learning to read biblical Hebrew (not speak, read!) far and away the most important skill is the ability to recognize its letters, vowels, words, and phrases. Learning to recognize nouns in their construct state (i.e., expressing an “of relationship”) is a wonderful way to build that skill. I’ve just rewritten and revised the introduction to construct nouns. The section is by no means exhaustive as I’ve not covered any of the numerous exceptions to the normal rules governing construct nouns. But, we have to start somewhere so we’ll start with the simplest case. Read the lesson and then attempt to count all the instances of the Hebrew word for “land of” (i.e., the Hebrew word meaning ‘land’ or ‘earth’ in its construct state. If you have questions just post them in the forums or as comments to this post. Take your time and have fun. Just a reminder, this is largely a blog dedicated to learning to read and understand biblical Hebrew. So, these posts are intended to focus on the Hebrew, not the theology. However, sometimes theology cannot be avoided and the theology advanced by these 6 verses simply cannot be ignored. 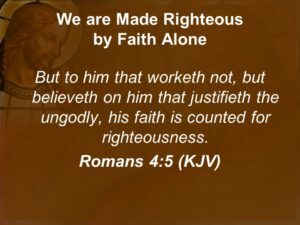 In this post, I provide translations for Genesis 15:1-3, 6 – a set of verses that constitute the lynchpin of the Christian doctrine of salvation by faith. 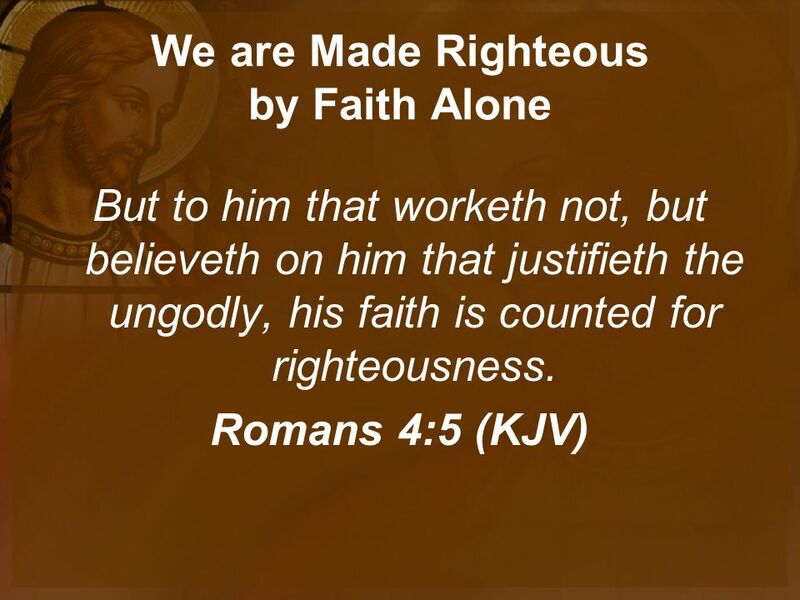 A doctrine that holds that we will attain eternal life, not by good deeds or by good works, but by our belief. You may be surprised to know that many scholars claim that 15:6 is an egregious mistranslation and that all English Bibles get it exactly backwards. However, the Hebrew text is quite explicit: God does NOT judge Avram. In fact, it is Avram who does the judging and he (begrudgingly, it seems) judges God as righteous. The five preceeding verses, Genesis 15:1-5, are important because they set the context. Specifically, they show Avram to have become frustrated (and maybe a little angry) with God for His incessent promising of descendents without any follow-through. Genesis 15:51)I will be providing the translations to verses 4 & 5 shortly. Genesis 15:6 – long and technical. Best studied with a cup of coffee and Bach concertos in the background. 1. ↑ I will be providing the translations to verses 4 & 5 shortly.